LTI, Inc. Director of HSSE & Compliance Anthony Knapp was in Albany, OR at the annual Veterans Day parade Nov. 11 and rode with Driver Trainer/Backup Supervisor Andrew Ruzanski in the Milky Way tanker on the parade route. "It was an honor to represent LTI, Inc. in the parade, and the Lynden Tank team should be proud of the tanks they build. I know I was," Anthony says. The Albany parade is rumored to be the largest veteran's parade west of the Mississippi. That's Andrew's daughter Maddyx proudly watching her dad Andrew behind the wheel. Anthony is a 20-year veteran of the U.S. Coast Guard and Air National Guard. LTI, Inc./Milky Way drivers are rolling down the road in new tractors this fall, the result of a large-scale major equipment acquisition. According to Dave Seaman, Director of Equipment and Maintenance, LTI invested in new power units this year which replaced some of the high-mileage tractors. "The new equipment is allowing us to lower our operating cost by reducing maintenance and improving fuel economy while maintaining payload," he explains. "The new units also provide a much better driving experience for our employees." LTI, Inc. has purchased 74 2018 Kenworth T680 tractors, the same tractor that Lynden Transport Driver John Schank drove across the country to deliver the Capitol Christmas Tree in 2015. As of early September, 16 new tractors were in service with another 58 to be delivered this fall. The allocation of new equipment is based on demand, according to Dave. "We relocate power units between terminals in an effort to improve utilization and customer service. Since our power units are each assigned to a terminal and activity, we basically do a direct replacement," he says. LTI, Inc. Equipment Maintenance Manager Jerry Crisp in Sunnyside and the team at Kenworth Northwest in Yakima work together on new equipment "UPFIT" which includes installation of the milk pump box, Peoplenet system, Lynden green vinyl wrap/door decal and equipment numbers, etc. Jerry and his maintenance team, along with Jeff Harris of Sunnyside operations, test run each tractor prior to delivery to LTI, Inc. Service Centers. "Our goal is delivering each tractor ready to work," Dave explains. "This is a major task for all of LTI, Inc., including administration, operations, HSSE, maintenance and specifically the Sunnyside maintenance/operations teams as they continue with day to day operations and the beginning of our harvest season. They get this done while maintaining excellent customer service." Utilization is considered along with a life cycle target of 800,000 miles, although some units run close to 1 million miles prior to replacement. "Today's engines and emissions systems are very expensive to repair and replace so at LTI, Inc., we really don't want to overhaul engines nor replace emissions systems during the life cycle unless absolutely necessary," Jerry explains. The allocation of LTI/Milky Way's used tractors is also carefully considered. "Our first priority is making sure we have a One Lynden approach regarding the disposal of an asset," Dave says. "Recently we have supported Alaska Marine Lines, Alaska Marine Trucking and Lynden Transport by transferring used tractors to each operation. We also sell direct, through a broker or auctions and we sometimes consider dealer trade-in values." Milky Way Drivers like Gene Staal of Lynden, WA and Anthony Platas-Tremont of Moses Lake, WA are enjoying the new equipment. "The truck is very comfortable, rides smooth and quiet and has great visibility," Gene says. 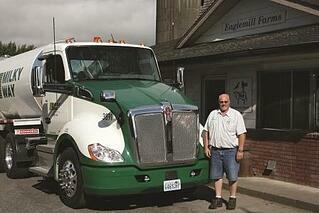 "This is a quality truck to match Milky Way's quality standards," Anthony adds. "There has been a noticeable mileage increase on my normal route." Milky Way Driver Mike Jalomo calls it the winter that never ends. Another driver said, "I’ve thrown on more jewelry (truck chains) in the last month than most people put on in a lifetime." Winter is never an easy season for the transportation industry, but some years are more challenging than others. "It feels like Mother Nature hasn’t backed down this year," says Kevin Greiner, Central Milk Dispatcher in Lynden, WA. From freezing rain and mountain pass closures to high winds and towering snow drifts, it’s been a tough few months for Lynden employees. "We have seen close to 24 inches of snow at one time in Whatcom county this year but when the Northeast wind out of Canada blows 50-60 mph for a week straight, 2 inches of snow can drift up to 8 feet really quickly. At that point the county essentially shuts down," Kevin explains. "The only way we are able to get around is to put our own snowplow to work to open roads up." To prepare for winter each year, LTI, Inc. incorporates winter driving awareness into monthly safety meetings starting in September. Everyone takes chain-up refresher classes – from brand new drivers with no mountain pass experience to 40-year veteran drivers. Coming to work prepared is heavily promoted in anticipation of the first snowfall. "Mother Nature never sends us an email saying that a storm is headed our way," Kevin says. “We try to watch forecasts as much as possible but sometimes you go to bed and everything is normal only to wake up to the wind howling and the snow blowing sideways. Our LTI, Inc. team is made of professionals who understand that rain or shine, commodities still need to get there." Driver safety is always a concern. If conditions warrant, two drivers will be sent out in one truck so the primary driver has a spotter and an extra set of hands. According to Kevin, "Our line of work is more than just getting in the truck and driving down the road. Local farm pickup drivers could be in and out of the truck 20 times during a shift so we really stress the importance of slowing down. Making smart decisions instead of knee jerk reactions when things get tough is what sets us apart from our competition." 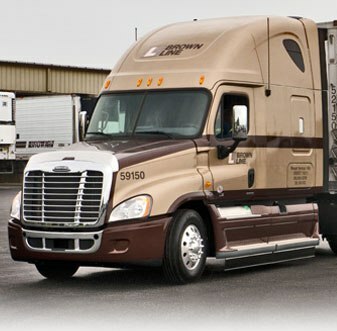 Lynden is known for having some of the best drivers in the industry. "They are seasoned, know the local areas, and know exactly what to watch for when they are out in the field. We always tell new hires that this is a 24/7 company and the cows don’t care that it’s Christmas. As a company, we do a really good job of focusing on our critical customers and areas." Mike Jalomo was stranded on the west side of Washington when both mountain passes closed. He laid over in Mount Vernon and went to work helping out Whatcom County drivers on their routes until he could make it back over to home base in Moses Lake. "I don’t think the average person realizes how much it takes to get the milk over the pass," he says. "We don’t have the luxury of sitting out a storm." "Mike and so many others are all stars who have gone above and beyond this winter," Kevin says. "The LTI, Inc. office in Lynden, WA lost power in January for about six hours and several administrative employees were still here working. At the beginning of January, there was a record snowfall in Caldwell, ID and Jason Jansen and Bob Griggs both suited up in insulated coveralls and rode around with Milky Way’s Caldwell drivers helping chain up and navigate roads until 2 a.m."
"Our drivers and the team supporting them did the extraordinary, working safely through tough conditions and long hours to serve our customers," says Lynden CEO Jon Burdick. "I’m proud of their dedication and what they accomplished." The Lynden family of companies announced earlier this month two executive appointments: Jason Jansen was named president of LTI, Inc. and its Milky Way division based in Lynden, Washington, and Bill Johansen is the new president of Brown Line, LLC based in Mount Vernon, Washington. LTI, Inc. is one of the Lynden family of companies and specializes in the transport of liquid and dry bulk commodities. 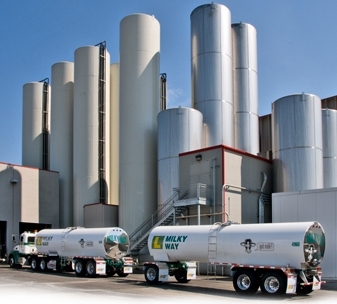 Its Milky Way division is a leading bulk milk hauler in the Pacific Northwest. Brown Line is a trucking company providing temperature-controlled transportation to customers throughout the U.S. and Western Canada. Jansen was previously president of Brown Line and Johansen was regional sales manager for Lynden Transport in the Vancouver/Portland area. "LTI, Inc. will be well served by Jason's proven leadership ability, focus on safety and efficiency, and passion for our business and its people," says Brad Williamson, LTI, Inc. board member and former president. Jansen began his Lynden career as an equipment operator with Knik Construction Co. and worked in various departments at LTI, Inc., before becoming regional manager of the Lynden, Wash. Service Center and five satellite locations. Jansen has served as a member of the Lynden Airport Board, the Lynden Chamber of Commerce Board and volunteered for the Lynden Boys & Girls Club. "Bill has over 30 years of experience in the transportation industry and an impressive record of success including leadership roles in air, LTL trucking operations and marketing," says Lynden Executive Vice President Alex McKallor. "His enthusiasm and positive approach will be a great addition to an already strong team at Brown Line." Johansen joined Lynden Transport in 2007 and was named salesman of the year in 2008. Prior to his Lynden career, he served as operations manager at Joel Olson Trucking and spent over 20 years in various leadership positions at Alaska Airlines. Johansen also served as a sergeant in the U.S. Air Force. He has coached youth sports in his community and received many awards during his extensive career. LTI, Inc. and its Milky Way division joined a very short list of nationally recognized companies as a recipient of an Environmental Protection Agency (EPA) 2013 SmartWay Excellence Award. The company ranked in the top one percent of partners with superior environmental performance. 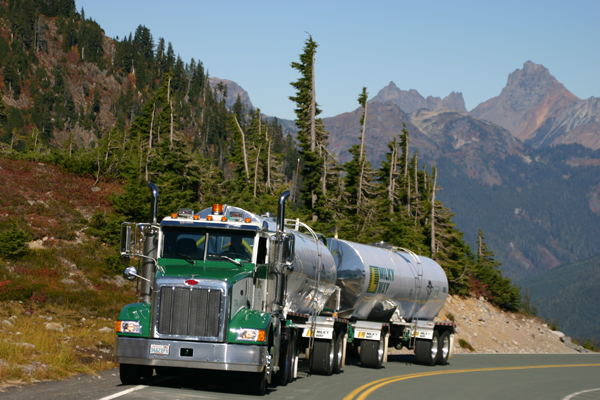 LTI, Inc. earned the top score among all the large tanker fleets in the U.S. based on its carrier performance for fuel economy, payload, idle time and emissions equipment. 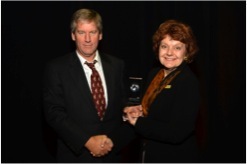 LTI, Inc. President Brad Williamson accepted the prestigious award at a ceremony in Denver (pictured) from Joann Jackson Stephens of the SmartWay Transport Partnership. "I am extremely proud of this award and of our entire team. It is the greatest environmental achievement a trucking fleet can receive, and it validates our ongoing efforts to make our operation the most efficient it can be," Brad says. The EPA award honors partners that move goods with the lowest levels of CO2 and other emissions. Fleet size and impact were also considered. Out of the 37 companies selected, LTI, Inc. was one of only two carriers receiving awards in the liquid- or dry-bulk commodities category. LTI, Inc. is now included as an industry leader on the Excellence Award List. LTI, Inc. and Milky Way were recognized as recipients of the Environmental Protection Agency Excellence Award. 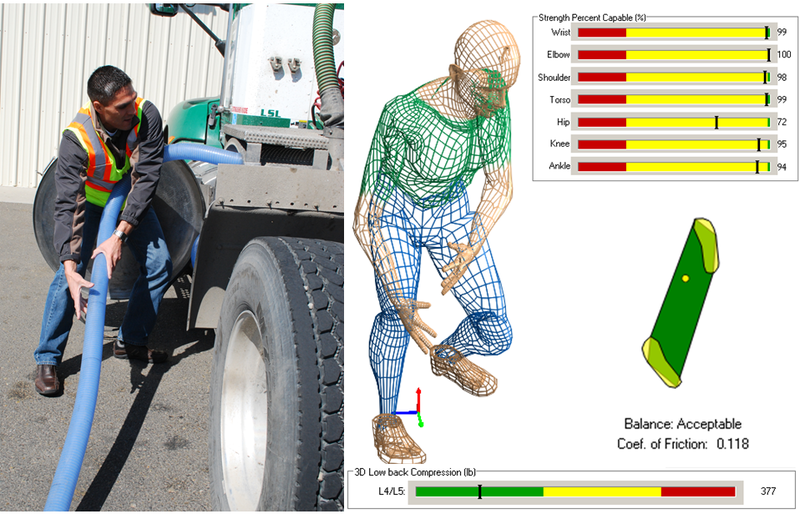 Lynden companies are customer-focused, but helping employees work smarter and safer is an ongoing goal as well. Last month LTI, Inc. Eastern Region Safety and Compliance Manager Allison Russell participated in hands-on research at the Milky Way Service Center in Sunnyside, WA with Han Kim from Labor and Industries (L&I). Han is an ergonomist representing L&I’s Safety & Health Assessment and Research Prevention (SHARP) program and the Trucking Injury Reduction Emphasis Study (TIRES) division. Allison, along with Operations Manager Darrell Scott, Driver Joey Fayard, Dispatcher and former driver Robert Tripp and Vice President of Operations Bob Griggs spent two days working together at a Sunnyside dairy and in the Sunnyside yard to explore ways to work safer while hauling liquid bulk products. Darrell Scott, Jr. hooks up a milk hose at the Sunnyside Milky Way yard. His movements are mirrored on a computer program provided by Han Kim of Labor & Industries. The team wound milk hoses, simulated different workplace scenarios and “did a ton of pulling and winding,” Allison says. “We discussed stresses on different body parts, low back stress, balance.” LTI, Inc. will take this information and work with Han to develop training videos and educational tips on proper posture and injury prevention. LTI, Inc. and Milky Way have regularly scheduled safety and training meetings but this is one more valuable tool to add to the mix. “We value our employees and want them to be at their best each day while serving our customers. This is one more way to improve customer service,” Allison says.